It’s not something that most people like to think about, and often don’t find the time to getting around to it however, if you feel strongly about what happens to your estate when you die you may want to consider making a Will. Should you die without making a Will or die without leaving a valid Will then you’re considered to have died ‘intestate’. 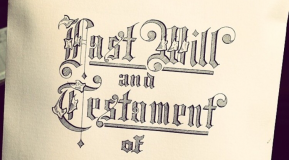 This will mean that you’re estate will be subject to the rules of intestacy and your assets passed on in accordance to those rules. You can see how these rules will affect you by visiting the Government website explaining what happens if you die without making a Will. If you have specific wishes as to who you would like to leave what to, and you’d like to find out more about how your partner or spouse would manage after your death then you may want to talk to us. We offer a free initial consultation and can sit down and explain to you exactly what would happen in the event of your death. We offer Will Writing, Estate Planning and Trust Services to ensure you have peace of mind should anything happen to you. You can contact us on 01332 223888 or simply complete the form below and we will contact you as soon as possible.